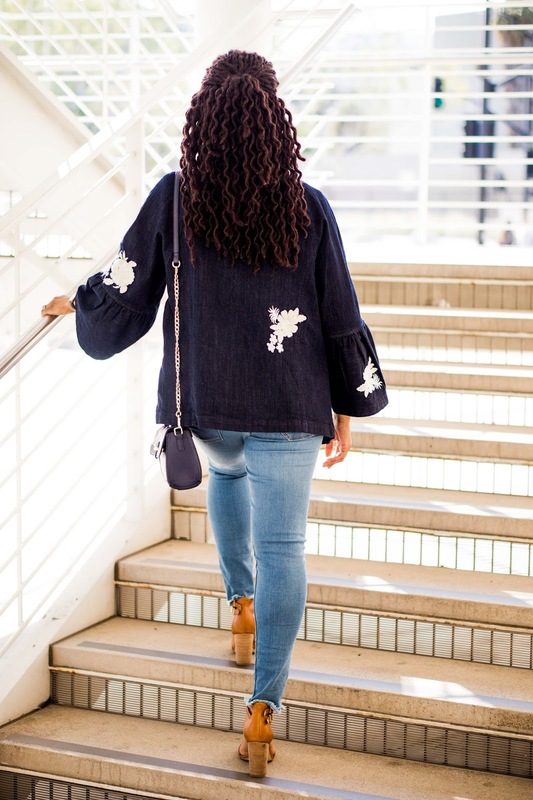 It really pains me to tell you that this embroidered ruffle sleeve denim jacket is sold out. I've linked to a similar one below, but the one that I'm wearing from Banana Republic is a real treat. 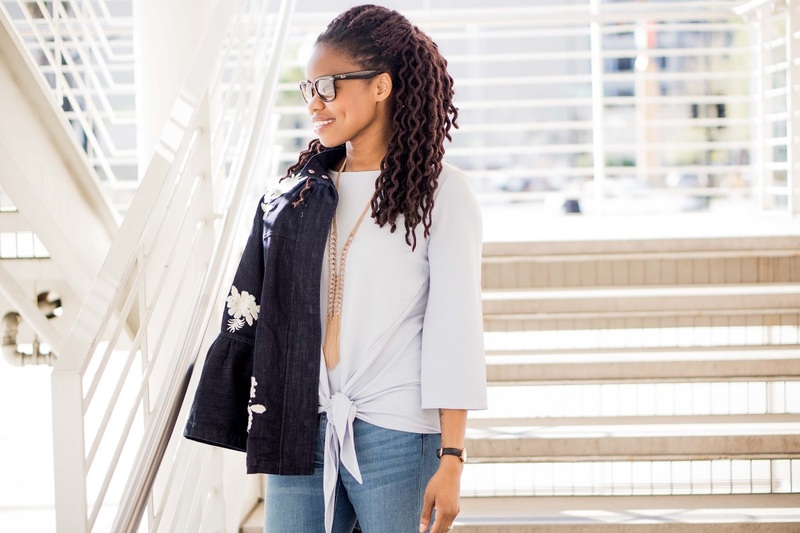 The three pieces I'm wearing really allow me to transition my wardrobe from winter to spring. 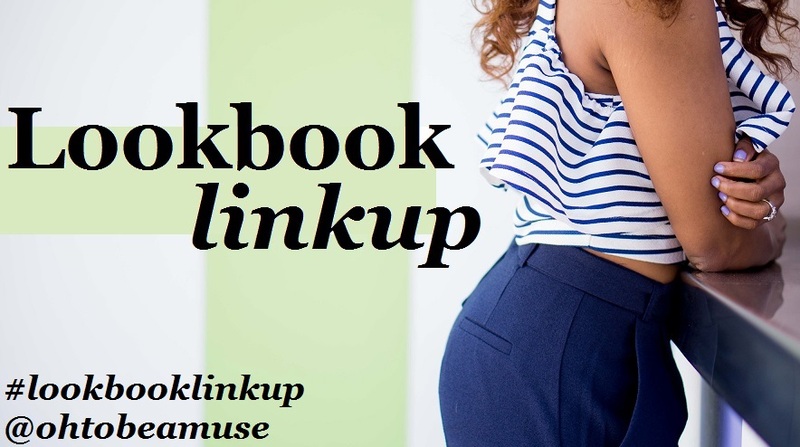 So today I'm not only sharing my look, but I'm also sharing six pieces from Banana Republic that I think can help move your wardrobe from winter to spring! First, a couple things. Today is my 7 year anniversary! We have dinner plans tonight. So, obviously, since today is my anniversary, this is not the outfit I'm wearing to celebrate. You'll get to see that on the Muse next week. This is the look I wore once I was able to get out and enjoy my first spring weekend in April after spending last weekend in the cold and most of this weekend turning my side yard from weed filled to Martha Stewart inspired. More on that later this week on the 'gram. So I'm wearing a lightweight crepe top and I've paired it with frayed hem ankle jeans -- both have a very spring feel. But I had to cap them off with the denim jacket because we all know how chilly the spring can be, especially once the sun goes down. It's really a wonderful transitional look. 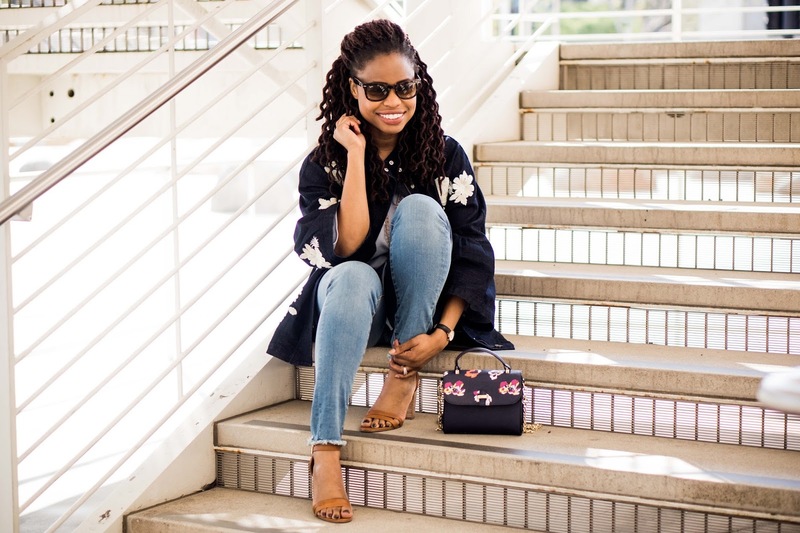 But the jacket doesn't just keep me warm, it also provides a really nice touch of both the embroidered and ruffle trends that have also made their way from winter to spring. And you know I had to complete the look with one of my favorite pair of block heels because it is spring after all. Merino Ruffle Vee Sweater -- comes in fun colors like oatmeal and magenta sky with a semi-fitted style and a ruffled detail that goes from front to back. Long sleeved but lightweight. Double Strap Block Heel Sandal -- a cushioned insole and memory foam aren't the only reasons you'd want to wear these all spring. You won't find a cooler block heel than this one. Crepe Ruffle-Hem Zip Jacket -- this jacket didn't make the BR pick list for no reason. The ruffle hem and crepe detail give it a unique look whether zipped or unzipped. Mixed-Stripe Sweater Skirt -- sitting at your natural waist, this semi-fitted skirt is quite versatile. You can show your legs in comfort and style. Did I mention this skirt has a matching top? Square Pinstripe Silk Scarf -- trade out your blanket scarves for your silk ones. We all know how great silk scarves can be in the warmer months, and I'm really looking forward to all the scarf styling this season, especially any with a clean, finished pinstripe look. Puff-Sleeve Shift Dress -- nothing is more fun than a fabulous shift dress. This one goes a step above the rest by hitting just above the knees with flounce, puffy sleeves (another great trend). This jacket is so gorgeous, love this look. Happy Anniversary!! I can't wait to see what you'll be wearing! I also am obsessing over that tie front shirt! So cute! What a unique jacket - I love the dramatic bell sleeves. Transitioning from winter to spring can sometimes feel like a challenge and its lovely to have these lighter jackets on hand. That jacket is amazing, I can see why it's sold out. What a great spot to take photos too! So much natural light! Happy Anniversary! That jacket is so perfect for spring! Love the flowers! Congrats on 7 years C! And i've been seeing BR come up with some really beautiful garments lately..
Loving the jacket and the hair. Best wishes for many more years of wedded bliss. Enjoy. . Happy anniversary, Cheryl:) Time flies by, eh? And that jacket is super cool! Happy Anniversary! Love the detailing on the top you look lovely! That jacket is seriously fab! No wonder it's sold out! Happy 7th anniversary and cheers to many many more! Happy Anniversary! Love this jacket! I wish it wasn't sold out! Happy Anniversary! Your jacket is so beautiful and your hair looks awesome! Love it! Happy Anniversary! <3 This is a lovely look. I am totally digging that jacket and the top. BR for the win! Totally in love with that printed jacket. Wow, it's brilliant! <3 Have a great rest of the week, lovely! Happy anniversary, babe! And that jacket is so fun! Ahh that is such a gorgeous jacket! You can just tell that it is exceptionally made! So sad that its sold out. How cute is that jacket? 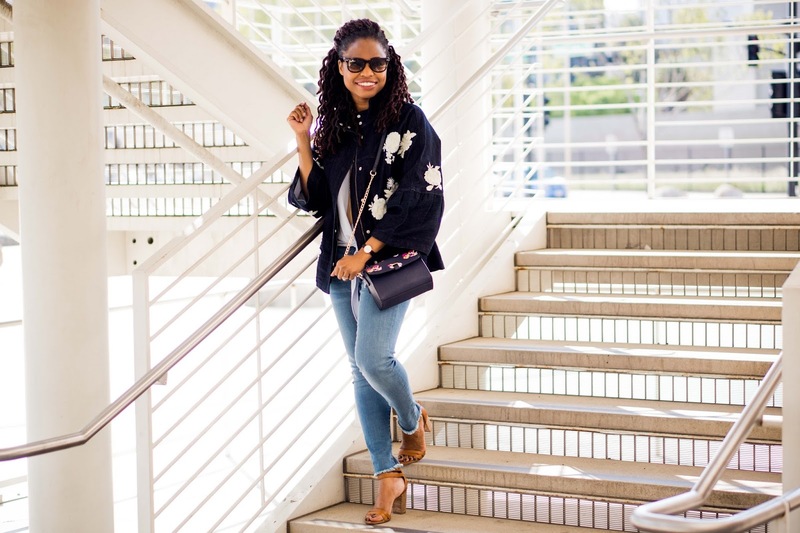 The bell sleeves add extra fun to a typical jacket! Not surprising about that jacket, but I love your purse too. Happy anniversary!